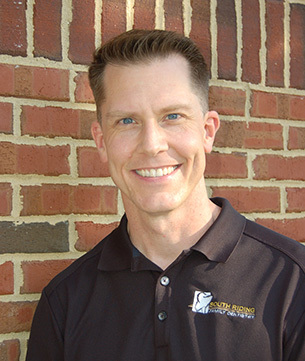 Dr. Carl M. Steger is a Fairfax, Virginia native and the owner of South Riding Cosmetic & Family Dentistry. He graduated from W.T. Woodson High School in 1991 and majored in biology at the University of Virginia. After graduating with honors from the Medical College of Virginia School of Dentistry in Richmond, he served three years of active duty as a captain with the United States Air Force, and completed an advanced education general dentistry residency at Barksdale AFB in Shreveport, Louisiana. He also served two years at Kirtland AFB in Albuquerque, New Mexico, where he received additional training in radiation safety, forensic dentistry, and combat casualty care. In 2002, Dr. Steger received the Air Force Achievement Medal for Meritorious Service and moved back home to begin private practice. Following several associateships in Northern Virginia, Dr. Steger ventured down to North Carolina for a change of pace and set up a practice from scratch in the Research Triangle area. Six years later, after a successful run with his new office and a much deeper understanding of how to run a business, he returned to his native Virginia and South Riding Family Dentistry. He purchased the practice in August 2012. With a firm commitment to advanced training, Dr. Steger attends many hours of continuing education every year. He is an alumnus of the prestigious Dawson Academy in Clearwater, Florida, where dentists learn advanced comprehensive smile design, including reconstruction of the bite and the latest in cosmetic dentistry. Dr. Steger also enjoys active participation in the local Loudoun County Spear Study Club, where some of the best orthodontists, oral surgeons, and general dentists gather to encourage multidisciplinary approaches to complex dental problems. Dr. Steger is one of a small percentage of dentists who use a microscope to ensure the greatest precision when providing your care. You can be assured that this extra level of magnification goes above and beyond the normal standard, and yields beautifully aesthetic and functional results. Dr. Steger excels at complex restorative and cosmetic dentistry, minor surgical procedures (including laser treatments), endodontics (root canals), and implant restorations. Dr. Steger is an active member of the Northern Virginia Dental Society, the Virginia Dental Association, the American Dental Association, and the Academy of Microscope Enhanced Dentistry. He enjoys donating his time to the Mission of Mercy Project — a humanitarian mission at the Northern Virginia Community College that provides free care to those less fortunate. In his limited spare time you’ll find him working out, mountain biking local single track at Fountainhead or Lake Fairfax, and traveling with family. He lives in Fairfax with his wife and two daughters. Dr. Steger is pleased to accept the Northern Virginia Magazine’s Top Dentist Award for 2015, 2016, 2017 and 2018!